We had spent five days reaching the high camp on K2. Climbing the Black Pyramid was the most fun I had ever experienced on an 8000 meter mountain. It was full on rock climbing at 22, 000 to 24, 000 feet with extreme exposure. I felt alive and fulfilled. 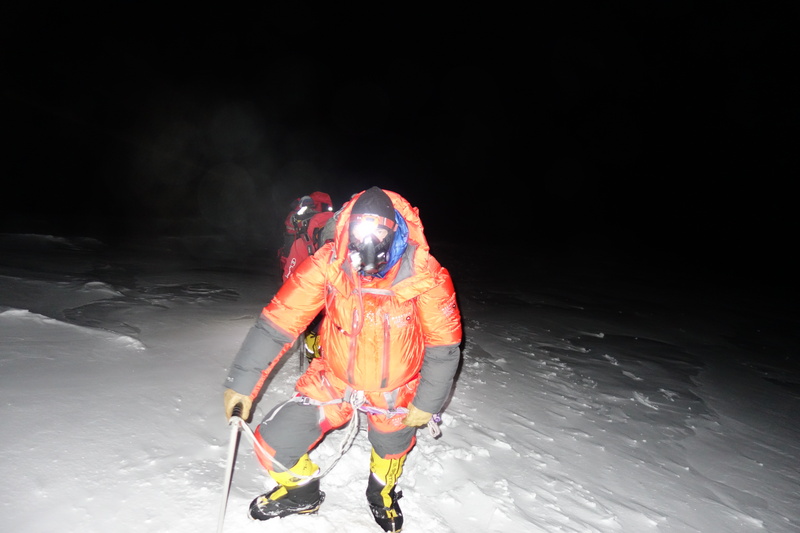 As I arrived at Camp 2 , Camp 3 and Camp 4 a cough had developed that I dismissed as normal high altitude climbing. But in fact it was High Altitude Pulmonary Oedema aka HAPE, a fatal condition where the lungs fill with fluids stopping breathing. The only cure is descending .. and I was climbing higher. Standing at a full stop I was surrounded by nothing. The air was black, the chill penetrating. The feeling of death was real. My shoulders hurt under weight of the pack that held my life support – two bottles of oxygen connected to my facemask. All I could hear was my own essence flowing through my sporadic, heavy breathing. My arms went limp as I struggled to remain standing. I lifted my head and looked for my teammates. “Ah, there is Garrett, Matt and Koncha. They are not far away, moving well but the gap is widening between us.” I told myself knowing the reality was serious and I was having problems. Only an hour out of Camp 4 at 25,500 feet on K2, I was dying. I coughed deeply, it hurt, each one nipping away at my strength. I gasped again for air. I felt like I was drowning. An immense feeling of debilitating fatigue overtook me. I felt discouraged, and disappointed. I was losing the physical, mental and emotional battle and there was nothing I could do to stop it. I felt helpless, hopeless and ready to capitulate to K2. A sense of overwhelming sadness penetrated me like a cold mist in a dense fog reaching every part of my mind, body and soul. It was all I could just to remain standing. “This is it.” Then I felt my life-force leave my body. It was like a spicket was opened allowing everything I was to leave my body. It was real, it was physical. My neck became weak as my head dropped against my chest. My right hand released the jumar attached to the fixed line. 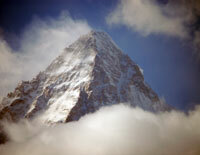 I stared at the small white spot illuminated by my headlamp against the white snow of K2. It was over and I didn’t care. All sense of motivation, any sense of ambition was gone, leaked out of my body. I didn’t look back, only ahead and down. I never considered turning back. Standing still now with Kami behind me and Kami Rita behind him, I was content to stay where I was. I wanted to sit down, lie down but my body had stopped working. I couldn’t move. I drew a deep breath accompanied by a deep course cough. My eyes now closed. Without consideration, a new thought formed in my dying brain. Why am I here? This lead to another why question and soon I was deep in my own world, oblivious to anything else, anyone around me or the fact that I was standing on a 50 degree slope in zero degree air temperature on the most dangerous part of K2, the world’s most difficult mountain. I thought about my mom and her battle with Alzheimer’s, the fact that I was on K2 to honor her. I had told the world that I was climbing K2 to raise awareness and money for Alzheimer’s. How could I just give up? Did I have a choice? I took another deep breath but this one was different. Something entered me as I inhaled. I felt a surge of energy, not a lot but enough that something changed inside. A sense of calm began to take over the sadness, they were now in competition. I took another deep breath and with my hands, touched my chest with my palms crossed. I deeply exhaled almost like purging the sadness from my essence. I felt the energy as I inhaled. It was real. I had no idea where it came from but my body began to react. I am not sure how long I stood there but suddenly felt Kami adjusting my oxygen bottle. I held up 2 fingers, he held up 3. The flow rate was now 3 liters per minutes. This added to my sadness. I looked at him with no expression, no words. I just looked at him. He looked back. I looked up towards the summit. It was hidden in the darkness of midnight July 27, 2014, my 58 th birthday. I took a step, and another. I picked my jumar back up and slid it along the fixed rope. A bright light flashed in front of me. It was sudden and disappeared quickly. I was confused for a moment then realized it was my teammates ahead looking up at the giant ice serac that guarded the summit of K2. Their headlamps were reflecting off the vertical ice laden face. It was like a tiger sitting on it’s haunches waiting to pounce. The ice had a dirty translucent glow to it, like the tiger’s tooth. He was growling a warning, a threat – don’t come any closer. I saw this and didn’t give it a second thought. I was self-absorbed wondering if I could take another step. But the sight of the serac perked me up knowing how close I was to the most dangerous part of K2, the section that killed many people including my friend Ger McDonnell in 2008. His body might have been somewhere near me. The gap with my teammates started to close. My pace had picked back up. I flashed my headlamp ahead looking for something other than snow. I knew the Bottleneck was ahead, full of black rocks, solid ice. If I could spot that, it would become my milestone, an intermediate goal that I could focus upon. Something to aim for, give me hope. A rock buttress appeared as I moved higher. I focused on it as I took another step. I was moving slowly but I was moving. After thirty minutes, I found where the white fixed line met the black rock buttress. Again, I stopped dead in my tracks. I looked up at the small rock climb required to reach the base of the ice serac and onto the summit. The rocks looked big, hard and tall to me. For the second time, I felt my body go limp. The overwhelming feelings of sadness returned now joined by greater fatigue. “I can’t do this.” I said out loud to no one. I gasped for air, opening my mouth wide to accommodate every tiny molecule of oxygen. I sucked what came in hard as if I was drinking. I coughed hard. I looked at my feet, defeated. The competition between sadness and fatigue was strong, neither would get me to the top of K2. Both would keep me from going home. Then, without thinking, I pulled on the jumar and put my left crampon points on a tiny rock about a foot off the snow. I pulled again and placed my right foot even higher. I was climbing again. My mind became occupied by the mechanics of rock climbing at 27,800 feet. I became consumed with details – small, short steps; keep the rope tight so the jumar will slide, control my breathing, control the cough. I was now climbing in my subconscious, unaware of my surrounding. Soon I was on top of the buttress. My headlamp illuminated the path ahead as I followed the line and boot path. I felt better but was shaky and lacked confidence. Turning back was not an option, never entering my mind. The sun was now above the horizon casting a soft glow on the giant ice monster and the path ahead. I could see Matt, Garrett, Koncha and Finnish climber Sammy ahead. I looked up at the 300 foot high ice wall that loomed above my small body. If it had calved, it wouldn’t had mattered. It would have killed me, and I didn’t care. I was now at 8000 meters, the Death Zone, feeling barely alive knowing I had more than two hours to go to reach the summit. The physical battle was taking its toll and I was losing. I watched Garrett and Matt cross the traverse. They made it look easy but both would deny it later. I clipped into the fixed line with my safety but not my jumar. One piece of nylon webbing held me to K2. The first part was a narrow snow path, no problem, but then the path disappeared into a vertical snow face. route as I came to a dead stop. I saw a few crampon scuff marks on the face. That was my path. I looked ahead and saw the vertical face become a steep snow ramp to the 70 degree slope leading to the summit. Again, I just stood and took on the thousand yard stare. I had no purpose, no motivation. I was stuck in my own world. Going on instinct, I took a step onto the face, holding the line for balance using the crampon front points as my adhesion to the face. Standing upright, face to the wall, I began to side step across the face. I was not afraid, I was not scared. I was tired. But it was what I was supposed to do, no further consideration was needed. I knew I could cross this. I have never been intimidated by exposure. If I fell, I believed the safety would stop me. If I fell, I knew it would be swift. If I fell, I didn’t think about falling, I focused on the mechanics of sidestepping across the 100’ vertical face. Halfway across, the thought entered my mind … how do I get back? On Everest in 2008, I turned back at the Balcony with the same thought. I could go higher but could I go lower? The echo was strong was from experience. I had turned back on Everest. My front points stuck into the snow wall supporting my weight, my hands on the fixed line kept me upright. I suddenly stopped half way across, my nose two inches from the same serac that killed my friend in 2008. I was once again frozen in time, unable to go forward or back. My lungs screamed for oxygen, I began to feel my body go limp for the third time in three hours. K2 was testing me and I was failing. d the voice. “Alan.” was all Kami said, his tone nonjudgmental, not full of worry. It was supportive. I looked over my right should to see him standing at the entrance to the Traverse, headlamp still on, pack full. I took another step and another. Soon I had both feet full on the earth’s surface, my crampons with full . I looked back at the vertical wall holding the Traverse as Kami made his way across. I looked towards the summit and saw a steeply angled snow slope providing the only path. It looked far way. I took a deep breath again trying to get back in touch with the elusive energy. It didn’t come this time. My climbing was now mechanical, based on years of experience and without thought. Knowing I only had one real choice, I started to take small steps higher. I put my jumar onto the fixed rope and pulled for balance and support. Each step was a struggle. Each took on a life of its own, a beginning, a middle and an end followed by long breaths. In spite of my own slow pace, I closed the gap with my teammates, now we were climbing as a six person team plus Sammy who was climbing alone and without supplemental oxygen. Climbing in a trance, the fixed rope crossed an ice bulge – solid clear ice where only my crampons would support my body. I watched Matt overcome the obstacle and started my own small journey. I tried to dig my front points into face of K2 but they were knocked back out against the concrete hard ice. I leaned back on the jumar, my body perpendicular to the highest slopes of K2. All of sudden, I started gasping for air. I was suffocating. I felt a wave of panic take over my body. Of all times, I had run out of oxygen in my bottle. I was now climbing K2 with no supplemental oxygen and my body was not acclimatized to this altitude. I focused on solving the problem. First I had to get over the ice bulge, then I had to switch bottles. I looked back at Kami who was watching me like a hawk. I pointed to my mask. He understood. This had happened on Everest when I was down climbing the Hillary Step. I knew I had to take care of myself, to do what I needed to do, I had to be self sufficient. Then without warning, my feet lost grip on the icy bulge, I fell flat on my face, my chest hit the ice hard, I grabbed my jumar as its teeth dug into the rope stopping any further fall. I was face down against the ice, unable to move. Again, I took a deep breath, full of nothing in this oxygen deprived environment. But it was enough to clear my head. I rolled over on my right side and pulled one leg higher. I spun my foot to dig the sharp points of my crampon into the ice. The points held this time. I pulled the other foot along side and pulling on the jumar as I stood up. I struggled the last section of the bulge to reach the safety of a soft snow slope at a 60 degree angle. The summit was still an hour away. Kami came up with a new oxygen bottle in his pack. I sat there like a child as he swapped the bottles. I felt weak, dependent, nothing like someone should approaching the summit of K2. With fresh oxygen, my head began to clear, I felt a bit better physically but mentally I had lost all hope. Then I looked up at the summit. Another wave of emotion overtook me, a different emotion. “I can do this.” I said. “I can make the summit.” And I started to climb again. The thought of descending never entered my mind. The fixed rope came to an end and Koncha took the lead to set a tiny line to the summit that we all followed. I moved slowly but with purpose now. The morning sun was now shining bright, warning up the below zero air. I reached the top of the snow slope and looked my left. The summit, I was at the summit of K2. I felt nothing. I slowly walked the remaining fifty feet to join the team. I came to a stop and slowly turned my head inspecting the summit. It was larger than most, fairly flat but towards China as it dropped quickly. Towards Pakistan it was a small cornice that dropped even faster. I hugged my teammates as I took off my pack and removed my oxygen mask. Once again, I became task focused pulling out my camera for pictures and videos. I then used my satellite phone to call my blog, leaving a fairly incoherent message. Then I called my friend and climbing partner, Jim. “I made it!” he already knew from following my gps tracker that showed me on the summit. As we hung up he got my attention as he firmly said “Alan, double check everything on the way down.” Cogent advice from the veteran. It was 9:00am. “Let’s leave in 5 or 10.” Garrett called out as we were now taking in the views. I had one last task to complete. I reached in my pack and took out the picture of my mom. This same picture had been to all my summits since 2008. Without words, Kami took my camera stepped back. I held up the picture and tried to smile. I fought back the emotions as my eyes filled with tears. Finally I realized where I was and what I was doing. I was overwhelmed once again. I stepped away from the group and my pack but careful to be clear of the cornice. I slowly turned my body looking in every direction, pausing at each cardinal point. I was on the summit of K2 but there no emotion of satisfaction, victory or joy. It felt matter of fact, mechanical. I knew I had to start the climb back down. But as I turned my head to take in the view, I collapsed emotionally. I was on the summit of K2. The surge came from accomplishing my goal, making the calls, being within myself on the second highest peak on earth. Again, I felt alone and sad but also elated hoping I had made a difference. My shoulders relaxed as I took a deep breath of the thin air, my oxygen mask on the snow by my feet. Slowly I looked at my teammates, proud of them. Then I brought focus to what needed to be done, my mind left the moment and focused on the future. I had to descend k2. I put my pack back on and put my oxygen mask back over my mouth and nose. We had spent thirty minutes on the summit. I lead our team lower, going carefully and slowly using an arm wrap on the fixed rope once again only attached to the earth by my crampons and a thin nylon piece of webbing to my harness. I reached the deadly ice bulge trap but this time went around it on the snow, pulling the fix line taught to avoid a repeat two hours earlier. I sat down on a small easement in the steep slope. I began coughing again, this time more violently. I felt something in my mouth, almost choking me. I reached in with my finger to try to clear it. I coughed hard as I started to gag. With a push, I coughed up a large piece of bloody phlegm. It landed a foot in front of Garrett. I looked at him. “Lets get down.” Was all he said and needed to be said. Garrett took the lead towards the Traverse. I followed with the rest of the team behind. The fixed ropes were so taught that it was impossible for more than one person to arm wrap or even use their rappel device so our descent begun to get spread out. I reached the Traverse and stopped. Garrett had already made it across. “Front point it.” He called out. It was what I had used to climb up and what I was planning. But my breathing was now labored, my lungs were hurting. I was thirsty. I made a mistake not drinking enough on the summit or eating anything but I didn’t feel like it or had simply forgotten. I was developing a case of High Altitude Pulmonary Edema or HAPE where the lungs fill up with fluids as a result of altitude and low oxygen. It is deadly and the only solution is to descend quickly. As my situation set in, I felt nothing of significance. I was on automatic, in the flow. I climbed to the start of the Traverse and moved my safety carabiner across an ice screw that held the safety line. I faced the icy wall once again knowing if I could get across this I could make Camp 4 and perhaps get some rest for the night. It was 11:00am, we had been climbing for 13 hours. I took a sidestep across the wall plunging my front points into the wall, looking for the scuff marks I had used previously. My breathing picked up, I started to heave, I couldn’t catch my breath, I was suffocating. I pushed my mask off my mouth and nose gasping in the cold air. I gasped. Knowing I was loosing control, the mechanics took over again. I placed the front my helmet against the icy wall. I was standing on my front point, heels in the air, head against the wall, once again stuck on K2. I fought to regain control, my breathing was exaggerated, I needed to relax, to calm down or this would be it. My breathing started to relax. I regained control and forced my body to relax. I took another sidestep holding onto the rope. And another step followed. In a few minutes, I had completed the traverse. I looked back to see Matt and Kami approaching. Once again, I felt little. I looked ahead and saw Garrett moving lower. I followed. As I reached the snow slopes above Camp 4, I suddenly had to urinate. It was forceful and sudden, I felt like I was losing control. But then alarm took over, my urine was dark brown, almost black. Dehydration was real. I had HAPE, dehydration, was fully fatigued and at 27,000 feet of K2. Once again operating on pure instinct, I went lower, careful at each anchor to double check my gear, like Jim had told me. The sun was now hot, I was sweating in my down suit adding to my dehydration. I was out of water. I finally reached Camp 4 and collapsed in the snow. I was spent, empty and had no idea if I could go lower. Slowly I began to drink some water the Sherpas had melted. I tried to eat but I coughed it back up. On my hands and knees I gagged at the High Camp. I had summited K2, but could I get down? This passage below could have been written, word for word by me describing my Everest experience at 28,000ft. The expression ‘this is it’ is exactly what I thought. As I said in an earlier post, I am looking forward to the account of your descent as this part of a climb is often overlooked but is often the most dramatic. It was for me. Thnaks Kathy, yes I will do all I can to support those working hard to find a cure for Alzheimer’s. Thanks for all your support. Alan, you had me in tears. I try and imagine what you must have felt like, to drive ourselves to such extremes is crazy. It always amazes me just how strong we humans can be. I am so curious about how your wife feels about it? She must be so happy for you to be home and safe. I thought about the same things when I read Jim’s book. I admire you both. Thank you for letting us be a part of yur adventures. Come to Olympia Washington. No words for you Alan! Simply Great would say!!! the sheer joy on being on top of K2 is something that cant be explained and that too for a cause..God bless you Alan! Alan, after reading about the physiological challenges you experienced on K2, both on the ascent/descent and on the trek out, I’m wondering how you’re doing now that you’ve had a few weeks home to recover. Do you feel back to “normal” yet? How long did it take for all effects of HAPE to resolve? Also – since you developed HAPE on this expedition, is that something you’d be more susceptible to on future high altitude climbs? So glad you are back safely. My heart was in my throat reading about the summit push. Thank you Diane. I’m doing well, summited my local 14,000 mountain Longs Peak a few days ago. I contracted bronchitis on the plane back home so that “grounded” me for a few weeks. Altitude is random when it comes to how it impacts climbers – you can do fine for years and then get hit so my experience may or may not have an impact for future climbs. I plan on climbing more 8000m mountains in any event! The only thing you do better than climbing, is writing! You’re damned amazing at both! Someone somewhere smiles after reading this most intensely interesting blog. BTW: Until I read this I’d thought bicycle racing was the “toughest” sport. Don’t tell the winner of TDF! Doesn’t matter whether you tell the winner of TDF or not — you have done this without EPO, HGH, cortisone, blood transfusions, etc. etc. etc. (I confidently presume)!!!! Alan, I have often said (and meant more than once on my far lesser adventures), fear is an excellent motivator. After reading your blog, and feeling my own emotions toil with all those tests you faced on the summit climb you faced and forced yourself past, I am uncharacteristically speechless as I think how I might face such tests. It is no wonder why K2 kills so many who try it; it would be so easy to give into the seduction to yield your life force in such extremes. But you didn’t. You have deep grit my friend! It is a very rare gift for those who work hard enough to actually earn it. Well done! Thanks a lot for sharing this experience of k2, all i can say about this is that it was immensly realistic.. Beautifully written. Grateful to know the end of the story is that you do make it back down. Great account of the climb. Thank you for sharing!! I was gripping my armrests as I was reading this account. Your inner strength to make it up and back came from your mother. Reading this account makes it seem even more amazing than I already knew that it was. my grandma is one of who are struggling Alzheimer, i am so moved by all you’ve done for them, it’s heart-broken that they forget everything gradually, but you remind me of doing more for her.thank you again. A gripping and exhausting read. Thanks Alan! Incredible Alan! You managed to put into words what few people climbing mountains can explain and express to others-that absolute battle with yourself when your body screams for you to stop but somehow you keep going. What a great accomplishment! When did you first notice the effects of HAPE? Was anyone else on the team affected by it? Gutsy stuff Alan….damned if I’d do it. Started coughing at C2 on the way up but I dismissed it as noraml coughing at high altitude. Only me. oh man, i was scared just reading this! God bless!!!! Great read, Alan. Congratulations once again on an amazing achievement! It sounded like a fun summit day, but you haven’t talked me into following your footsteps yet 😉 That little trick of yours to cough up frozen phlegm has been in use by high altitude mountaineers for years. It’s known as “doing a Somervell” (Everest, 1924). Glad to know I was not the first!! Great stuff Alan! You overcame some huge obstacles to meet your goal. Well done. Wow. So much of what you have accomplished is mental. This is gripping stuff. Thank you for sharing. I was on the edge of my seat Alan, I thought we were losing you for sure, will keep watching for updates and progress reports! That was a gripping and powerful account of your treacherous summit climb. It was a mighty struggle, but you had what it took – the proof is that you summitted and returned home. I am glad that I could play a small, supportive role for you as you seized this huge challenge. Well done my friend, well done! Jim, it is friends like you who create the framework for friends like Alan to accomplish the things he does. I can’t even remember all the training climbs I read about that you were there for him, for K2 but it was so cool to read them! You’ve shared your skills and wisdom with me too and I am most grateful and even though I am a recreational mountaineer at best. It is people like you and Alan that motivate me to finish when I find my own dark patches on some of the harder adventures. It is also that framework of friends like Alan, TerryP and Rodney who fuel your own adventures and of course Max the wonder dog and Gloria 🙂 In summary, it is only an arm-chair opinion of course but you played no small part in Alan’s success my friend! My heart was racing as I read this account, Alan. Your strength and resolve are inspiring. Can’t even begin to imagine what you went through up there, but one thing is for sure – your Mom was watching over you – so very proud of her son. Super amazing & inspiring experience Alan!!! You’ve written it so lively that one can feel of being there. This piece of writing is sufficient to motivate many climbers who have a hope to go to the top of a challenging mountain. You are an inspiration for many climbers including me! So glad you are safe! It sounds like you pushed yourself to the edge. What made you push on where you turned back on Everest twice? This story had me on the edge even though I knew you made it back safe. Albert, I turned back on Everest 3 times! Made it on my 4th attempt. The reasons varied from fatigue, bad preparation and simply losing my motivation. Alan, an amazing, heartfelt, gripping and altogether inspirational account! Congratulations on scaling and safely returning from K2 -‘a mountaineers true zenith’. You can feel justifiably proud of all you have accomplished personally and what you have done for your chosen cause! An amazing read Alan, true grit and emotion. A must-read for armchair and actual mountaineers. Great blog post! You have a book here. My suggestion is to write about your climb and then write about your mothers struggle and your struggle as a care giver and intersperse the two into one, both are human struggles. I think it would make a riveting book! Wow. Just wow. My first thought is that I am so glad I wasn’t aware of your struggles while they were happening. We knew it would be hard. I don’t know if you looked back through Jim’s facebook posts but we were a pretty tight knit community of your supporters that night. All of us anxiously awaiting updates, literally sitting on the edge of my chair. I don’t think I took more than two breaths reading this whole post. It has taken you a month to get this story out, for obvious reasons. It might take me that long to process it. I hope the descent was anticlimactic….seriously. Whew! Thank you for sharing this very real, raw account of your summit of K2. We only had an inkling of the dangers as we blithely tossed about the facts of summit numbers and deaths on K2 prior to your departure. We knew enough to know that you were in physical danger and to daily pray for your success and your safety, but we had no idea how this would test you to the core of your being. You did this for all of us – those who have lost loved ones – those who are currently heart broken and struggling – and those who’s fate will be to face this cruel and unrelenting diagnosis. You have seen the face of death – in more ways than one – and you have not allowed it to define or defeat you. Thank you for what you have done – and will continue to do – for all touched by Alzheimer’s/dementia. You’re very simply. . . our hero.